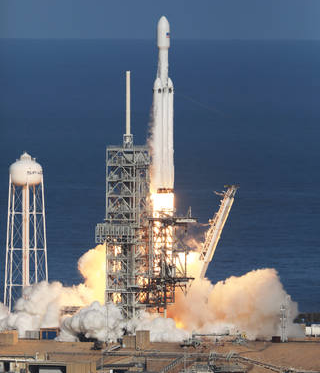 The launch of a SpaceX Falcon Heavy rocket on its demonstration flight is another sign that NASA's Kennedy Space Center in Florida is continuing to grow as the nation’s premier, multi-user spaceport. The new vehicle lifted off from NASA’s historic Launch Complex 39A at Kennedy at 3:45 p.m. EST on Feb. 6. Acting NASA Administrator Robert Lightfoot congratulated the entire SpaceX team on the successful launch of the Falcon Heavy. "All of us in this business know the effort it takes to get to a first flight of any new vehicle and recognize the tremendous accomplishment we witnessed today," he said. "I am really proud of the hard work of our NASA team, in particular at Kennedy, for the transformation into a multi-user spaceport. Watching the Falcon Heavy rise above the historic pad that has been the launch point for so many critical missions is a true testament to the hard work transitioning our nation’s launch infrastructure in support of the commercial launch industry." Kennedy Space Center Director Bob Cabana also expressed congratulations to Space X on the launch of the Falcon Heavy. "The successful launch of a new vehicle on its first flight is a significant accomplishment they can be very proud of," he said. "As a multi-user spaceport, I look forward to the continued expansion of commercial spaceflight from Kennedy and the integration of a new class of launch vehicle into our Nation’s space program." 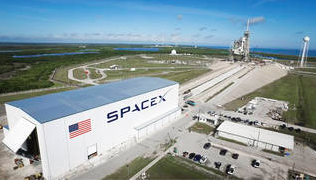 In 2014, NASA signed a 20-year property agreement with SpaceX for the use and operation of the launch pad. Beginning in 2011, Kennedy sought partnerships with the U.S. aerospace industry to use former space shuttle facilities. Today, NASA has partnerships with more than 90 companies that enable commercial space manufacturing, processing and launch operations along Florida’s Space Coast. Kennedy’s first significant partnership with industry allowed Boeing to use Orbiter Processing Facility 3, now known as the Commercial Crew and Cargo Processing Facility, or C3PF. Here Boeing is manufacturing and processing its CST-100 Starliner spacecraft, which is slated to carry astronauts to the International Space Station for NASA’s Commercial Crew Program. SpaceX will similarly launch astronauts from Launch Complex 39A for NASA. A handful of NASA employees serve as customer advocates and support the space center’s commercial partners. Through reimbursable Space Act Agreements, NASA provides services that are needed at a spaceport. "We support launch campaign activities such as propellant and life support services, which includes providing commodities such as helium and nitrogen to support launch, flight hardware transport and roadblock security support near the launch pad," said Robyn Mitchell, the NASA customer advocate who supports SpaceX. In her customer advocate role, Mitchell monitors the partner’s processing and facilities schedules to help ensure their operations and mission milestones are met. This includes integrating support plans in response to the partner's requests for services. "When partners, such as SpaceX, are preparing for a launch, we have Support Readiness Reviews," Mitchell said. "While SpaceX is responsible for the launch vehicle and payload, NASA organizations verify support requests are complete and confirm the readiness of Kennedy's facilities, equipment and infrastructure for launch." Mitchell noted that the ongoing responsibilities of her office are key to establishing and maintaining a multi-user spaceport capability at Kennedy, specifically working with commercial partners to help them identify technical requirements, anticipate operational impacts and develop solutions taking advantage of the center's unique launch infrastructure and capabilities. The test is evidence of the transformation of NASA's Kennedy Space Center as a multi-user spaceport. NASA and its commercial and international partners are looking to return humans to the Moon and beyond, and there will be opportunities for a wide range of rockets and capabilities. NASA’s Space Launch System (SLS) rocket and Orion spacecraft is targeted to lift off next year from nearby Launch Complex 39B. The initial SLS rocket is expected to have a liftoff thrust of 8.8 million pounds, and is designed to be an evolvable launch vehicle able to meet the most challenging deep space crew and cargo needs. 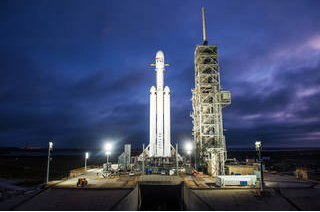 “As SpaceX continues to refine operations of its Falcon Heavy rocket, we welcome this capability to be added to those available soon from NASA’s SLS,” said Tom Engler, Kennedy’s director of Center Planning and Development.